Well today started out rainy and cold so I thought it would be the perfect time to try out some new bread recipes. So I dusted off the old Baking cookbook and searched online until I found a couple that I wanted to try. 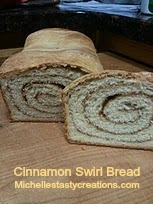 I tried a Cinnamon Swirl bread from the King Arthur Website that was AMAZING and really easy to make. Here is the link to the recipe and picture of what it turned out like. And can I just say, YUM! Dissolve the yeast with a pinch (1 tsp.) sugar in 2 tablespoons of the lukewarm water. Let the yeast and water sit at room temperature for 15 minutes, until the mixture has bubbled and expanded. This is proofing the yeast and I always do this step, even if not called for. I find the yeast is better absorbed if proofed first. In the bowl of a stand mixer combine the dissolved yeast with the remainder of the ingredients. Mix and knead everything together until you've made a smooth dough, about 7 minutes on the second speed. Adjust the dough's consistency with additional flour or water as needed; but remember, the more flour you add while you're kneading, the heavier and drier your final loaf will be. Place the dough in a lightly oiled bowl and turn once to oil both sides. Cover the bowl with plastic wrap and a dry kitchen towel, and allow the dough to rise, at room temperature, until it's nearly doubled in bulk, about 1 hour. Rising may take longer, especially if you've kneaded by hand. Give it enough time to become quite puffy. While the dough is rising, make the filling by stirring together the sugar, cinnamon, and flour. Transfer the dough to a lightly floured (1 Tbl) work surface, and pat it into a 6" x 20" rectangle. Brush the dough with the egg/water mixture, and sprinkle it evenly with the filling. Starting with a short end, roll the dough into a log. I pull the log towards me as I roll it so that I get a tight roll. Pinch the ends to seal, and pinch the long seam closed. Transfer the log, seam-side down, to a lightly greased 9 x 5 or 10 x 5 loaf pan. Tent the pan loosely with lightly greased plastic wrap. Allow the bread to rise till it's crested about 1" over the rim of the pan, about 1 hour. Again, it may rise more slowly for you; let it rise until it's 1" over the rim of the pan, even if that takes longer than an hour. While the dough is rising, preheat the oven to 350°F. Bake the bread for 40 to 45 minutes, tenting it lightly with aluminum foil after the first 15 minutes. The bread's crust will be golden brown, and the interior of the finished loaf should measure 190°F on an instant-read thermometer. Remove the bread from the oven, and gently loosen the edges with a butter knife. Turn it out of the pan, and brush the top surface with butter, if desired. Try to let it cool completely before you cut into it!